As much as I enjoy Superhero games, it's always more fun for me when there is an actual mission going on and not just an all-out brawl. Having to rescue hostages, recover stolen goods, escape the authorities and so on. Glass beads, cardboard chits and spare dice are all well and good, but I like to have something a bit more special on my table. After all, I spent all that time making the terrain and painting the miniatures, why not take the time to work on some nice objecives? A, very kind, remark about one of my objectives on the Lead Adventure Forum inspired me to put together a look at my growing collection of gaming markers and objectives, you'll notice that many are on 50mm bases to be used for Secrets of the Third Reich, but they still work fine for Super System. There are some great pieces hiding in the various Heroclix ranges, especially the Organised Play Rewards, which can go for quite cheap once they've fallen out of the meta. Above you can see the Clix M'Kaann Crystal and Cosmic Cube as well as Young Hellboy (great for Golden Age games) and a fun little marker that came with The Question. A couple that see service in SOTR, a stack of containers and an injured soldier still work for Golden Age Supers and pulp games. A packet of 1/35 Jerry Cans and some bases can give you all the objectives you'll ever need. I was given a couple of these GW Tyranid "growths" a while back in a box of spares and thought I just had to do something with them. Some Liquid Greenstuff and a few spare parts later and I came up with these two grotesque beauties. I tried to paint them a bit like the "Creep" from StarCraft to make them more generic. I love scratch-building. Its a challenge and it clears out my bits box (bits garage, whatever). Above you can see "The Football" and Mjolnir, my two favorites of all my objectives. The football is a 1/35 briefcase, zombie hand and a piece of chain from something. Mjolnir is a small rectangle of carved foam and the handle from a GW Beastman weapon. Both simple, both look great. A few smaller objectives that I did specifically for Super System; the bomb is spare bits and plastic rod and was originally made for The Joker to use in a Batman SS3 game. The Spear of Destiny and Dragonballs are for a big SS3/4 game that I've been working on for a while, both are scraps from other projects with a little Greenstuff. Hope you gleaned a few ideas to add that little more to your games. A Custom Heroclix Military Tank #V005 from the Batman set. The new tank is a Robogear model with a little conversion. This baby will be going up on ebay in the next couple of days to help fund other projects. Ghost Rider an Silver Surfer. Both are Clix that I touched up slightly, fast and easy jobs that look great. Something that was being discussed a fair bit around the Westwind Empire of the Dead Kickstarter was the concept of Victorian Age/Gothic Horror/VSF Superheroes and how they could be done. As a result I saw a great many (very nice) Victorian Batmen and Ironcald Men. Although the minis were nice and the concept was sound, I never really felt satisfied by VSF Batman stalking London by Gaslight. What interested me in VSF gaming to start with was the actual fiction of the Victorian era, Verne, Wells, Burroughs and so on. Even Dickens and non-SF Victorian writers are something I really enjoy, having studied Literature at University. So I've been mulling this problem over for a while, how do I make heroes that are Victorian, but still recognisable as heroes? The League of Extraordinary Gentlemen is one way, but after some though, I've hit upon another. Found in deepest Africa, living with the apes, this wild woman is cautious around men and is frequently escaping from all attempts to "civilise" her. Tarzana, however, seems to have an inborn sense of justice, breaking up fights and preventing assaults whilst she is loose in London. Possessing the strength of many men and the agility of a great ape, Tarzana is a force of nature unto herself. Miniature: Reaper do a nice (if naked) wild woman with panther. Miniature: Any Victorian Gentleman holding a lantern. West Wind's old Watson is a good match. Many know the story of John Carter, the American gentleman and soldier who became a Warlord of Mars. Few, however, know of J'onn J'onzz, the proud Thrakk warrior who was transported to Earth in much the same manner Carter came to Mars. On Earth, J'onzz was hunted and feared as a possible invader related to the dread Tripods. A warrior born, J'onzz knew only one way to prove that he meant the Earthlings no harm and ever since, he has fought evil wherever his Warrior's Code leads him. Miniature: In my opinion, it's hard to go past Tin Man's Horde Warrior. Some say he is an exiled Prince, some say he rules Atlantis and some even say that he commands the loyalty of sea monsters. The Great Nations of Europe fear his wrath, but when the Martians invaded, Nemo showed himself willing to defend innocent people from the wrath of the monstrous Tripods. Not always on the side of justice, Nemo can still be counted on to defend the planet from great threats. Miniature: There are plenty, but I feel that the West Wind one really captures the "feel" of Nemo from "20,000 Leagues Under the Sea". Ok, so Zorro isn't technically Victorian. However, more than one Zorro Text indicates that the title is hereditary and that sometimes brothers have shared it. Also, Batman (post-crisis at least) was partially inspired by "The Mark of Zorro", so there's a good lead in there as well. I like the idea of a Victorian Batman, but I just couldn't reconcile it with a mythos until I hit upon Zorro, it may not be to everyone's tastes, but I think it fits fine. Miniature: Again, many out there, but Boot Hill's has a great deal of character. Kang the Conqueror and a Police Van. So this is one of the main reasons I wanted to start this blog, too many ideas for heroes and never enough time to make them all. The idea with this series is to look at alternate ideas for and/or incarnations of superheroes in the hope that it can kick-start someone else in the hobby. What I failed to realise when I was 6 was that Power Rangers were indeed Superheroes, complete with secret identities, powers and wise mentors. 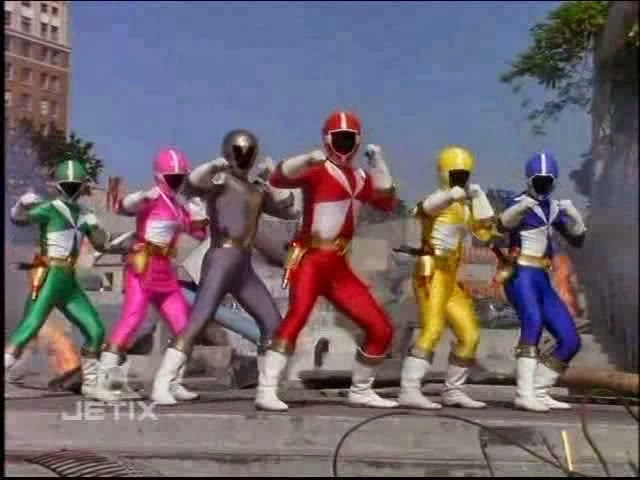 That said, a team of 5 almost identical supers in bright spandex never really appealed as a miniatures project... until I learned about Lightspeed Rescue. Unlike other Rangers, the Lightspeed Rangers are entirely products of human technology and ingenuity. They work for what is essentially a military operation, acting as an elite force to handle situations that normal search and rescue cannot. Also fight monsters, hey, it's Power Rangers. Also, the team has no secret identities and operate out of a giant submarine base commanded by a classic "stiff-upper-lip" officer type. In a sense, Lightspeed Rescue is an odd mash of Power Rangers and International Rescue. Now, if you managed to get through at least a little of the video, you'll have noticed the snazzy jacket and wrist morpher combo that the Rangers sport when not in spandex to fight evil; personally, I think a uniform like that for fighting evil would be pretty funky and would keep the core theme (of Super-Rescue) without too much of the "Teenagers with Attitude" stuff. Seriously take an axe to Lightspeed Rescue and what you get is an emergency rescue team, given powers with advanced technology, working for a SHIELD/International Rescue[ish] organisation and fighting alien monsters. Pretty cool huh? To get you started: I'm thinking, Super Agility, Martial Arts, a ranged attack and maybe some kind of force field for heroes like these. After a few months of working almost exclusively on my minis and terrain for Super System, I realised something; I love Superhero Wargames. Yes, I have my five Secrets of the Third Reich armies, a GASLIGHT force, Empire of the Dead factions and countless little other projects, but my major hobby expenditure for the past few years has definitely been on supers. There's only one problem with this trend; getting other people to play. Actually, I'm pretty lucky, there's at least three people at my local club that are willing to play a game or two of Super System, then there's my Ultimate Alliance campaign, and roleplaying and... ugh! Too many thoughts to keep in my head. So this is where I plan to keep my thoughts as my projects progress and also anything else supers-gaming related that I think people may want to see. Even more to come? You bet!